How can lawyers make their online content more visible for prospective clients? In this episode of Lunch Hour Legal Marketing, hosts Gyi Tsakalakis and Kelly Street talk to Dave Chaffey about how lawyers can implement technology for digital marketing. Prospective clients are drawn in by good online content, but the huge number of marketing technologies available may make the choice seem daunting. Kelly and Gyi get insight from Dave on how lawyers can prioritize the tech that will serve them best. Dave Chaffey is co-founder of SmartInsights.com, an online publisher and learning platform which helps marketers get the most from their digital marketing. Gyi Tsakalakis: This is our intro right here. Ready go. Kelly Street: Let’s go back in time. Boom, Kelly is in ninth grade. Thank you. Gyi Tsakalakis: Hopefully they don’t listen to the show. Kelly Street: I am the first person in my family to have a four-year degree so boom. Kelly Street: Thank you. So I think the idea of law school was like — it’s such a weird concept that they were like, who are you and so — anyway so needless to say, I did not go to law school, but I do keep toying with the idea of like, do I want to torture myself and go to law school. Gyi Tsakalakis: You, you totally and especially if you can take out a huge loan. Gyi Tsakalakis: At a very high like especially a private loan with like 10% interest and you really, you really have no desire to practice law, that is the best time to go to law school. Kelly Street: Preach Gyi, yes. Gyi Tsakalakis: So good luck. Kelly Street: I mean look at everything you’re doing with your law degree. Gyi Tsakalakis: Yeah, that’s right. Look at what I’m doing. What am I doing, jamming. Any who?? Gyi Tsakalakis: Let’s get into the episode. Kelly Street: That was so creepy. Gyi Tsakalakis: All right. Let’s get into the episode. Kelly Street: That was even worst. Gyi Tsakalakis: All right, let’s get into the episode. Kelly Street: But all right, let’s talk to Dave Chaffey, joining us from across the pond, and hopefully he doesn’t shake his head in shame at my attempt at a British accent when he listens to this episode later. But everybody, strap in and get ready for another episode of Lunch Hour Legal Marketing. 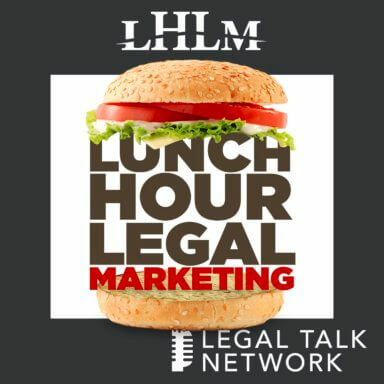 Intro: Welcome to Lunch Hour Legal Marketing, with your hosts Gyi Tsakalakis and Kelly Street, teaching you how to promote market and make fat stacks for your legal practice, here on Legal Talk Network. Kelly Street: Hello, Gyi Tsakalakis. Gyi Tsakalakis: Kelly, how are you today? Kelly Street: I am great. I don’t know if this has dawned on you, but we at Now are cultivating this amazing international podcast. Kelly Street: I know. I know. We have been lucky enough to have a Canadian guest, and a guest who joined us from Dubai, but originally came from Germany. And now we have a lovely British guest, which as the listeners will know is my favorite accent in the world. So I am triply excited. Gyi, do you want to introduce our guest? Gyi Tsakalakis: I’d be honored to welcome Dave Chaffey, Founder of SmartInsights.com, which is a learning platform for digital marketing. Dave, welcome to Lunch Hour Legal Marketing. Dave Chaffey: Thanks Gyi. It’s great to be here, and thanks Kelly as well. I hope my accent is — we’ve got around 30 regional accents in England. So I hope mine works for you and the listeners. Hi to all joining today as well. Kelly Street: It absolutely does. So where is your accent, where does it hail from I should ask right away? Dave Chaffey: I’ve moved around a lot. So we have the southern, the BBC accent. So I’m from Portsmouth in the south of England, but then I moved to the north and I’m now in the Midlands, so it’s a mix. Kelly Street: Awesome. And for anybody else like me who is a fan of a great British Baking Show, obsessive fan, you watching that show is an awesome introduction into just how different the accents are throughout the whole of England, it’s really cool anyway. Dave Chaffey: You’re, you’re right. Yes, I’m watching that with my family and we can see we have French and Asian people on there as well, so we’ve got a nice diverse set of people on the Bake Off fans who live here as well. Kelly Street: It’s pretty cool. Okay, so let’s turn it back to marketing. So what — if you could tell our listeners, what makes you an expert in digital marketing? Dave Chaffey: Well experience I think. I’m very fortunate to have worked in digital marketing since it was called the internet marketing in the mid 1990s, that’s when I started training and consulting and learning about the fantastic tools that are available for digital media, digital technology to help with our marketing. So I’ve been training and consulting and in the last eight years we’ve launched Smart Insights as a global platform as Gyi mentioned it’s a learning platform, that we actually have paying members who use our resources in over 120 countries. So we’re quite international as well and our members use our content to help them plan strategies, plan campaigns. And we really work with businesses across all sectors from the very smallest businesses to the largest international businesses like 3M for example. One of our customers we were working with some of the Procter & Gamble brands this week in a training workshop as well. Kelly Street: Awesome. 3M is actually located. Well their headquarters are located where I am, which is Minneapolis, Minnesota. Dave Chaffey: Yeah, it’s a small, small world. Kelly Street: Yes, it is. So right off the bat, my first question for you, digital marketing is such a wide breadth of topics and options and things, do you have a few or maybe even just one favorite digital marketing strategy? Dave Chaffey: Yes, it’s yeah, more of a tactic than a strategy, but it’s organic search or search engine optimization, SEO, the listeners might have heard it. So it’s using those free listings in Google in the main to attract visitors to your site through inbound marketing so having the — the best content to suit your audience and to help them. In a legal sense, it would be to help them learn and develop in the — in their profession. But for us, I’ve always focused on SEO and training courses and in writing guidance, best practice and I was mentioning there are global audience and really it’s thanks to Google and our SEO that we’ve achieved that. So we have — although we’re a business-to-business organization, we have around half a million visits to our site each month, and 80% of those are driven by Google and organic search. So it’s — it’s much stronger than say social media or email marketing. For us those important at other points in the customer journey, but I’m a huge fan of SEO and I’ve been studying it and that the changes Google has made since now a lot of us say using smart phones to search. Gyi Tsakalakis: Excellent. Well you’re in good company, because we are strong believers in the power of SEO and creating great content and earning visibility. We’ve always thought that the leg up, the genius of Google is that they’ve found a way to capture intent right, so whether it’s social media or any other kind of advertising, it’s more interrupting right, where search, people are actually going out and looking for whether it’s a business or an answer to a question. What kind of tips could you — help folks understand from an SEO perspective? I know it’s — it’s a whole strategy and probably process that you have in place for taking on a new client or customer advising someone, but what are some of the headlines you would suggest to lawyers and thinking about how they approach organic search strategy? Dave Chaffey: Sure. Yes, you’re right, Gyi, it is all around intent. So the — the starting point is us with a lot of good marketing, understanding your audience and looking at how they search. So creating target keywords, combinations of words that people search for is essential as a starting point. I think often within professional services you do get some regional behavior so people will search for the type of legal service plus the location. I’m sure that’s obvious, but that’s an example. So for me I’m based near Birmingham, so if I was looking for corporate law in Birmingham, any lawyers in that area should try to get visible through registering with Google My Business. I was during a training session with a smaller German business this week and they weren’t actually registered in that. This was actually a branding business brand, an identity business, but they were registered in Google My Business, so when someone was searching for branding services in Hamburg where they were based, they weren’t visible. And the great thing about Google My Business is that it’s free, and also if you have multiple offices, multiple locations you can ensure that they’re all included there and Google will naturally promote you towards the top of the list. So beyond understanding the audience search behavior, there’s a whole raft of techniques, which I think everyone knows that you need to have the match between the copy, the content on the Page, and what people are searching for. So to give an example of that we, with the name of our business Smart Insights you might guess that we share a lot of stats about how people use the internet. So if you search for say social media statistics or mobile marketing statistics, you would find that Smart Insights ranks quite highly, and that’s because we’ve created articles around those topics. But they’re not just short articles, they’re very comprehensive. Google tends to favor this real detailed content that when people visit it, they will stay, they will browse for longer. And when you research into this, you find that in a competitive area like that where there’s a lot of people publishing information about statistics online, you actually need usually around 2000 words plus to engage the audience and then Google will see that people are sticking around on your — on your site. But even more important, people will be linking to you as a reference source, and that’s why our statistics I suppose perform so well, because if someone is writing an article about trends in mobile marketing and they want to, to make a point that today 70% of our audience using smart phones by default, they will link back to us as a reference and Google has always used these citations as they call them as a way of the strength and quality of content and sites. So to boil it right down it’s those two key factors of a match between what people are searching for in your content and the number of links to your site. So working with influencers to encourage more links back and partners within your industry is really important as well. But ultimately it all comes down to content and I think one of the big trends over the last five years I’ve seen in digital marketing and marketing broadly is the prominence of content strategies and thinking more carefully about the types of content that will support your audience through the customer journey as they’re looking for professional services in the legal sense. Kelly Street: I feel like I need to get a t-shirt that says, it all comes down to content, because Dave I tend to be — at least my history with marketing is more on the content side, and that’s a lot of what I do now including of course this podcast and so I just, I really like that. I can picture the t-shirt already. Dave Chaffey: Yes, if you wanted a nice visual t-shirt, obviously people have said since I think started in digital Content is Queen, Content is King and that’s no different now, but what I would suggest anyone listening in, if you have a look — I’ll talk you through a technique to review the content you use in your business. We call this the Content Marketing Matrix and if you Google this, it’s an example of our successful Content Marketing Matrix and it’s got many images, so you’ll see different versions of this, but it’s simple enough, it’s power is, it’s simple enough – who’s playing on it, on a podcast. So on the horizontal axis, you simply look at the part of the funnel that you are looking to attract people, so the top of funnel content would be on the left and that might be our content like the posts on our blog, on social media marketing that I mentioned. And then as you go from left to right, you have content that’s deeper down the funnel so some of our mid funnel content is a template on planning a digital marketing strategy. That’s really our hero content and for us because we get a good volume of search traffic that enables us to generate around six to eight thousand new contacts or leads on our database each month and I’m sure many of the listeners who are looking at their professional B2B services would use a similar approach. And then to complete the picture you might have your bottom of funnel content as well and this is the “what you need to convince your audience to buy a service or subscribe in our case to our membership” so we would — we create case studies and testimonials, which again are important in legal marketing to show that you’re a good credible company to work with. So on the why, I hope this is making sense so far, the why is a bit simpler. At the top you simply have more emotional content, so this might include infographics and visuals, it might include your content marketing t-shirts and at the bottom, you have your more rational content, which might be the case studies I mentioned before or whitepapers about your services. And it can be offline as well. Actually t-shirt Kelly is a great example of content marketing. I was — I was doing a presentation for ON24, who are like a webinar service and they actually at the event. They had a machine where people could print t-shirts of their own design related to the company name and they actually had several hundred people sign up and get one of those t-shirts. So I thought that was a great, great bit of marketing. But that’s the Content Marketing Matrix, does that make sense as I’ve talked you through it. Kelly Street: Yeah absolutely, and I definitely know we will link to that or maybe even put the image in our show notes. Dave Chaffey: Great, feel free. There’s also a Content Distribution Matrix, which is — it’s one thing to create the content and what we would do I would suggest if anyone takes a look they can all do a review of their current content and then maybe take a look at competitors in the sector. So other legal companies that they look up to and then you can do a kind of gap analysis between the two and come up with new ideas. So it’s great for ideation, but yes, the Content Distribution Matrix that’s then all about the techniques you use for sharing content as well to complete the picture. Gyi Tsakalakis: Well, I’m glad you mentioned that, because I tend to be — not to diminish the importance like — the cornerstone of course, is you’ve got to have something on your pages worth talking about, sharing, linking to, but I often think that it’s so — someone everybody’s focused on, well just create this great content and people come, and often the distribution or the amplification of the content is lacking and so you might — you might actually have some of the best pages on a particular subject, but if you don’t get them out in front of the right audience or amplify them, then you’re not going to get those things that you mentioned in terms of citations, links, which are such important signals at least in the context of SEO. Dave Chaffey: Yes, that’s spot-on Gyi, you are right, and I’ve heard, one of the best sources for learning about content marketing if anyone’s not aware of it, because it’s the single best source and I’m not talking about our business, although we cover a lot on content marketing, is the Content Marketing Institute and this was founded by Joe Pulizzi now 10 years or so ago, when he wrote a book called ‘Get Content Get Customers‘ and yeah, he’s really emphasized the importance of working with influencers as well. And I think it’s a realization now that I’m fortunate to be an influencer within marketing and I’m now seeing more businesses coming direct to me through social media or via email, saying would you like to join our influencer program. So I think within content marketing influencer outreach and having a good process for that is it’s getting more prominence and there’s a lot of great tools as well to find out your network and the type of within your — within the sphere of legal marketing. For example, you can use tools like Tracker or Onalytica is one based here in the UK, and it will actually show you a map of the influencers in your sector and who those most important influencers are in terms of their reach and credibility. So yeah, well worth looking at that technique and finding publications you can work with as well as a part of that as well, so journalist influencers of course. Gyi Tsakalakis: Excellent. I think it’s so important really regardless of what business you’re in, but in the context of legal marketing to really, to your point earlier Dave, about understanding your audience and I know that one tool, that people use to sketch out their audience and get a better picture of that is our personas. And I kind of want to your thoughts on personas, are personas useful in your opinion, or are there problems with personas, talk to us a little bit about how to build personas whether they’re useful or and maybe what’s wrong with them? Dave Chaffey: Sure yeah, I’d love to. I’m a huge fan of personas, because as you say marketing is about understanding the customer, and what better way can you have for getting a shared understanding in a business of who the customer is, and — and it really gives you that that focus. So I first came across the idea of personas when I was working with HSBC as a bank and they were looking at different types of banking audiences. Now within legal of course you might have your business-to-business and your consumer personas, but I think it’s important for each to have the idea of a primary persona, so you can really focus on your core audience, and that may change through time. So when we launched as a site giving advice on digital marketing, our main persona was a digital marketing manager, so a specialist in digital, but as we’ve grown and digital I think one of the key success factors is integration, digital is now much more the responsibility of your CMO and your VP of Marketing. So our personas have extended to include that more senior audience. So I guess the takeaway is there. it’s good to have a primary persona to focus on, 00:21:40 that within the company and that may change through time. It’s worth remembering as well that, if it’s a Web Design persona, it’s not necessarily the most important customer type by volume. So I know when — when Ford were working on personas for their cars, they didn’t use some petro head guy as the persona. They actually gave — they had a female persona who wasn’t like not interested in cars, maybe she was a single mother, so she wasn’t buying as part of a family group. So she was more challenging both to engage and to explain what those different audiences were. And if you look at car sites they’re very good at defining the top tasks that a persona like that might have is there, they’re working through the education content on a site to engage. So, so yeah, those are some of the top level benefits and approaches. You were asking, are they — they’re not a hundred percent good and like any tool, like a penknife they need to be carefully used. And I think what I see is that often personas are too superficial. They do have value if it’s just explaining the type of role, but the personas that we share on Smart Insights they actually go down into more detail. You need to look at the pain points of your audience, you need to look at what turns them on, what excites them, what value they’re looking to get and then also understand a bit about the context. So which scenario are they in as well. And going back to what we were discussing earlier with content marketing, you need to really look at mapping different content through the customer journey. I was doing some consulting last year, and it’s a large business to business organization and they said, we’ve got these personas Dave, but they’re not really driving the content on the website. We need to operationalize them they said. So that’s when we created a three-step content map for each persona as well. We’ve also looked ourselves at updating our personas recently and if anyone’s looking for more detailed guidance on persona creation for b2b, a couple of sources I’d mentioned other than Smart Insights, one would be HubSpot, the marketing automation platform. They have great examples of how to develop more detailed personas and then you also have Adele Revella, and she’s formed what she calls the Buyer Persona Institute, and she gives a much more detailed b2b persona breakdown that we’ve actually used in updating our personas recently. So I hope it’s useful to share those two examples where people can find more, how to create personas that are more effective. Kelly Street: Awesome. One of the things that I ran across was a talk that you gave or maybe it was — it’s just the slides, because I just found the slides, but was a SlideShare and we will of course, link to it on Marketing Strategies for 2019. Now I — this episode will probably go out around 2019, and so it will be closer than we’re recording in October, so I can’t imagine it now. But, what are the kinds of things that people should be looking to for the future and looking to for what they should, maybe change for their marketing strategy or add to it, in order to be prepared for technology that’s coming? Dave Chaffey: Yes, I’d love to run through some of the ideas Kelly, and incidentally I will share a secret. So with everyone on the podcast that we actually write that — we do a blog post on the trends for 2019 every September, because we find there’s such a level of interest in trends, whatever the industry is. So looking at trends within legal sector get in there before your rivals do, and we would find that as we come up to Christmas like some of those statistic posts that I mentioned earlier, we would get 10,000 plus visits a month through that one post, and we also feature it in SlideShare as well. In terms of the trends, I think what’s important will depend whether you’re a strategist or you’re more working on the tactical marketing campaigns for your legal company. For strategy, I think it’s very much about digital transformation as I mentioned earlier, we’re seeing — we’ve done some research recently where we’re seeing the around of the third of the audience that we’re talking to are planning to run a digital transformation program in the next 12 months, and around a quarter already have a transformation program in place. That won’t be relevant for the very smallest businesses or startups, but we’re seeing that people are looking at the reason you need transformation is that digital is so complex today, that you need to review your capabilities and look at your resources, your technology, how you manage your data, your whole digital marketing strategy to really take advantage of the benefits. CRM is often a key part of that as well. And then within — I think the other reason for transformation is to ensure that you want it to integrate it within the organization, because what you see in many businesses is that as we’ve seen digital channels growing in importance, there’s been separate teams set up and they often become a silo in a larger organization and really what you need is the digital skills need to become part of the whole marketing team’s activities. So rescaling is a key part of that. And if I had my way we wouldn’t talk about digital marketing, we would talk about multi-channel or omni-channel marketing, because it’s all about this integrating the different online and offline touch points, but we find there’s lots of people still are searching for digital marketing, so that’s what we offer templates and strategies to help with that. In terms of the tactics what I would say is it would depend on your maturity really. We ask a question every year on the blog when we write this post, we say what’s your number one priority or wish for the year ahead, and not in terms of what’s hot or what’s cool, because often I think we can be a bit like Magpies. I don’t know whether you guys have heard Jeff Bezos and him saying that we’re all after the shiny objects. Dave Chaffey: And if ever I meet and chat with people at events, people always say, Dave, hey what’s the next big thing, and I just want to say well, get the basics right first before you worry too much about the next big thing. And so what we found over the last few years, it was mobile marketing that was the top-rated commercial improvement people wanted. Then it was content marketing, but what we’re now seeing are really two areas, one is marketing automation, so to make better use of automated emails as you’re nurturing your customers and your prospects from prospect to customer, and personalization as well. So to, to recommend in a legal sense, you’re not recommending products perhaps, but you’re more likely to be recommending content which will help a return visitors to the site, decide on the best content to help them to decide who to choose. But what we’ve seen this year quite strongly is that the main commercial driver in our audience at least which tend to be quite sophisticated, a lot of them are looking at artificial intelligence so AI is the current number one in our votes of top technologies for 2019. Kelly Street: I’m so glad that you landed there on AI because one of the other things in your — in this SlideShare was adapting, you had a slide on adapting too early and Gyi and I have talked about and spoken about voice search and how there is some optimization you can do for it but really it might still be a little too early to know what’s going to happen or different strategies to use. So how do you think about or what do you think about AI, like can you start putting things in place for it or is that also maybe a little too young in its technology life? Dave Chaffey: Yeah, that’s — AI is real interesting in terms of when you should review and look at the opportunities. I would say really rather than saying what can we do with AI, it’s more a matter of prioritizing for the business where the weaknesses are. The way we tend to look at it is we think of a customer lifecycle, so any audience is going to go through a series of touch points regardless of business and it’s a question of saying, well do we have the right marketing communications in place to nurture people along that customer lifecycle. And what we see when we’re consulting, we will find often there’s very big gaps in terms of that nurturing process. So to take a simple example, I was working with a B2B company this week and whenever I work with a new business, I’ll do a bit of mystery shopping. So I subscribed to their newsletter and just see what their first touch point that key welcome message is. And in this case it was a simple courier font that we all know and hate saying thank you for registering and really that was all that that most important email that business will ever send to its new prospects, that’s all it was. So clearly improving that welcome message would be a first step talking about the benefits of the brand. But then beyond that what would be the next best message that you might send someone out to target them with relevant information on the services they were interested that would be the next question. And yeah, AI will be large, will have a big impact in ten years but what I’m describing there is really simple rules based automation that if you don’t have that in place then you shouldn’t really be looking at AI right now. I’d say if you do have a good mature marketing automation program, where AI can really help is within the personalization on the website. So we all know that the retailers, the likes of Amazon and the travel companies, the likes of Expedia, they’ve had personalization in place a long time to recommend products. For me, the exciting thing within a profession like legal marketing is not so much recommending products and host deals but it’s about recommending the best content for a returning visitor to the site. So I think that’s a trend that we’ll see happening more. In terms of other applications of AI, there’s — there are a lot to go through. We actually wrote a post last year, 12 applications of AI of which personalization was one. One of the other voice search you mentioned was another worth chatting about that a bit more because I think you’re absolutely right, that’s the case where there was that record wasn’t there, I don’t believe the hype that I like to remind myself of and I think voice search particularly in the legal profession won’t have a big impact as many people are saying. I’ve seen these stats saying that by 2020, 50% of searches will be voice-activated and I just don’t believe them and yet, there’s so many publishers sharing those and I’ve actually looked at the source and very often, it’s one blogger sharing what another blogger has said and you go back to the original source and there’s really no evidence for this. Sure, it may be in the level of 10% but I think a lot of those voice searches will be people on elects so where they’re asking about the weather or they’re setting a timer or alarm. It’s not really going to cannibalize the desktop or mobile smart phone search that people will use. There will be a lot more smart phone activated search but people will look at the results on their smart phones so that’s nothing new. I think there are a couple of other areas for legal marketers which are far more important and interesting. In the near term, one of the big trends I’m seeing is what design is called conversational UI so user interfaces, so we’ll have seen these as consumers ourselves when we are using chatbots like the Facebook Messenger chat bot. And if you want to take a look how those are changing, take a look at the Nike, the footwear company, clothing company, take a look at their chatbot because it’s effectively their messenger chatbot is replacing the website. There’s really no — it’s like going through a sales assistant dialogue and within — that may be something if you’re in — if you’re thinking about legal marketing, it’s likely you may have had a live chat if you are a large organization for some time and you’re working with consumers. If you’re looking more at business legal advice, there’s a very exciting technology and I’m excited about this because we use this technology ourselves, it’s the next stage on from live chat where you’re actually having interactive dialogue on the site. So the classic way of inbound or content marketing is that you’ll get someone’s interest on their website through a hero content asset, they’ll subscribe and you’ll send them a series of emails. But often those are going to be lost amongst all the other emails that we have in our inbox. What these new technologies do is to have a interactive dialogue actually there on the site so we use a technology called Intercom and we’re finding it’s we’re really popular with visitors to our site, it’s engaging them and we’re able to recommend content depending on their audience segment and how far through the customer lifecycle that they are. So that’s another application where chatbots and this company Intercom provide automated chatbots there’s others like Lyft in this area as well that I’d recommend anyone in legal marketing to take a look at that type of technology. One final thought on AI before we leave it and that’s really you should be thinking not about AI in general but machine learning, which is about understanding historical interactions you’ve had with your audience and using that that data to predict the future what’s the most relevant messages you could send in the future for that type of person. So really learning from the past to inform the future, that’s cool and I must mention as well but no machine learning will actually generate content for you, so this is way — but maybe in ten years time, we won’t have to hand create so much content as we do now. There’re already some publishers who are using machine learning to create documents and manage the latest standards. So lots of ideas there in AI Kelly. Gyi Tsakalakis: Yeah those all, you touched on a lot of great future and even I think even some of that’s going on now. The one thing for listeners’ benefit that I would tie back to and that you’d said at the outset is to be so conscientious about how you implement these technologies because so often people get excited like you said and the way that they start to use the technology actually becomes a liability in terms of inauthenticity, right, so whether it’s marketing automation or AI all of a sudden now your chatbot or your email campaign or the content that’s being generated doesn’t feel as authentic as it would be if you had done it manually. And so I would just caution folks that are starting to embrace these technologies, I think there’s no question that they play a role and they’re going to play a larger role in the future but be very careful about how you implement them and the devil is in the details. You can actually turn off more of your audience if it comes across as inauthentic if you know it — The upside is — there’s a lot of potential for it but just be very careful about how you’re doing that because you might find yourself sending messaging out that doesn’t speak in the voice that your audience is accustomed to hearing from you. Dave Chaffey: Yeah absolutely Amen to that and I think another danger with technology is that all relevant features aren’t used. Marketing automation which very, very powerful technology as I have said you can set up these nurture sequence where you target people by the type of industry and their interest but what we find in our research of marketers across sectors is that many of these automation features aren’t used and it’s really just a glorified email marketing system where the same newsletter is being sent out to everyone and there’s very little dynamic adaptive content being used. So really the businesses aren’t getting their return on investment from this content and the marketing automation as well. So what I would advise is yeah it’s like any strategy you need to prioritize your strategic options which align with your business priorities and there are so many technologies out there now, it’s — I don’t know whether you guys anyone listening has seen the super graphic that a guy called Scott Brinker he now works for HubSpot he created this first in 2011 and he identified 800 different — tech marketing technology brands. Dave Chaffey: He’s gone on updating that each year and it’s now a crazy visual, it wouldn’t fit on it — on that t-shirt it’s, like I think he’s up to 5,000 different technologies that marketers can chose. So really prioritizing the ones that matter is needed. What we’ve tried to do to is to simplify it and we haven’t managed to simplify it that far as we have identified 30 categories across the customer lifecycle of marketing automation and other Insight’s technologies, so that we can learn about our audience to any business needs. So we are actually updating that neck next week. So there are a lot of free tools that you can use as well as so we were talking about keyword behavior earlier, so using the Google Keyword Planner, Google Search Console those are two of the categories on our — in our 30 most businesses. I think should use those but often they are not used inside the business, they might be used outside at agencies. So this is why going back to transformation, there are so many technologies, you are not going to get them all in place and customize them in a six month period. You need a long term roadmap where you prioritize them and customize them to make the most of them. I think that’s what’s needed. Gyi Tsakalakis: And thank you so much for taking the time to speak with us today and our audience. We will make sure to put a link to the manifesto in the show notes so people can take a look at that because I do think there’s some timeless lessons in there and also some great guides, but Dave thank you so much again and if you ever find yourself in Chicago, Minneapolis please don’t hesitate to reach out. Dave Chaffey: I may well be visiting before too long. We have got relatives in Minnesota. Dave Chaffey: So maybe — maybe in a year or two, you weren’t expecting me to take you up on that but maybe I will, but yeah thanks so much for the questions Gyi and Kelly and I hope the — through looking at the trends, there’s some practical takeaways for the marketing team members that we have on the call today. And if anyone wants to follow my latest updates then a LinkedIn is probably the best channel and I’d be happy to answer any questions on my LinkedIn as well. Kelly Street: Wonderful. All right if you like what you heard today please find us on Apple podcast and give us a lovely rating there. Connect with us on social media Twitter is awesome or any of the other ones are great too. Thank you so much for listening and join us again for our next episode. Outro: Thank you for listening to Lunch Hour Legal Marketing. If you would like more information about what you heard today, please visit legaltalknetwork.com. Subscribe via Apple Podcasts and RSS. Follow Legal Talk Network on Twitter, Facebook, LinkedIn and Instagram and/or download the free app from Legal Talk Network in Google Play and iTunes. The views expressed by the participants of this program are their own, and do not represent the views of nor are they endorsed by Legal Talk Network, its officers, directors, employees, agents, representatives, shareholders, or subsidiaries. None of the content should be considered legal advice. As always, consult a lawyer.